Added a new chipping mode to the main menu. Grids on the session screens focus on the first 60 yds/m. Added a new sensor status indicator that is only using one block. Added a new sensor power saving feature. Click on the sensor status to sleep the sensor, or go F10->Sensor->Sleep. The sensor will auto sleep by default after 30 minutes of no activity. Set the duration in F10>Sensor->Auto Sleep. The sensor is also put to sleep when the software is closed. A security password can be configured for the FlightScope X2 Wi-Fi network. Connect the sensor on USB and click on "Wi-Fi Setup" in the setup wizard. The firmware version of the FlightScope X2's Wi-Fi module is now available on the F10->Sensor->"System Info" dialog. Sensor firmware updates are now delivered through the internet when a connection is available. Added a new driver optimizer icon at the top right. The optimizer screen now has a publish feature. A short summary report can also be sent to a label printer. Added target camera calibration in the F10->Sensor menu for FlightScope X2 complete systems. The calibration must be performed outdoors and from the main menu(not in a session). The driver optimizer screen has been changed to show new optimality contours. There is not one optimal available anymore, but rather a 1st level optimal is given. Sliders have been added to change smash, launch angle and backspin. The values can also be manually entered by clicking on them above the sliders. Only the current club’s min/max ranges are now shown, not all the clubs anymore. Grouping radius has been replaced with grouping diameter. Backspin and side spin has been replaced with spin and spin axis throughout the application and reports. Added a "Setup Wizard" button on the sensor connection page in the activation wizard. Added a generic 3D driver with an F10 option to choose between the TaylorMade R11 and generic driver. Speed and acceleration graphs are now plotted versus distance, not time anymore. Removed "Coming soon for wedges" from the club analysis screen. The user manuals are not part of the FlightScope setup exe anymore. They are copied from the install CD or downloaded from the internet. The X series quick reference guide is also included. Multiple F10 entries under help had been made for the different user manuals. The manuals can also be updated through the internet. Reports published to emails are now sent through the FlightScope server. The client’s email client is not used anymore. Reports are queued if the PC is not connected to the internet. The reports are sent the next time on start-up or through the F10->Publishing menu. The user is now always asked to select the target line on the camera image (X2 Complete only) when a new session is started. The target line also goes back to the default (middle of camera image). Removed the camera target line selection from the Setup Wizard. All shots recorded during the session are now rotated when target line is changed during a session. Setup Wizard and ball origin is now using the correct sensor model image. FlightScope Media Player now has a new icon and background image. The new X1 and X2 serial number picture is used in the activation wizard. The normal shot plot screen is now used when video recording is enabled. FlightScope X2 camera now does white balance correction every time after the brightness is set. Updated the sensor status hint to show what will happen when it is clicked. Updated the screen map images to show the new sensor status. The activation wizard now also sends the sensor firmware version to the activation server and includes it in the email that it sends to support. There is not an option anymore to skip firmware writing on a USB cable. Removed "Print invalid shots" from the publish dialog and invalid shots are not printed. Renamed "Include filing space" to "Include page margin" on the publishing dialog. The installer now as a better silent install option with the /silent parameter. The setup wizard input boxes and the altitude form now has range checks. The screen map button has been changed into an icon at the top right of the screen. Added a warning if hitting a shot outdoors, but mode is set to indoor. The advanced settings (F10 menu) is now shown when the user clicks on the top left logo. Disabled the SwingView Pro Shortcut if the plugin is not enabled. Improved the application start-up speed. A message saying "start a new session” is now displayed when a different sensor is connected. 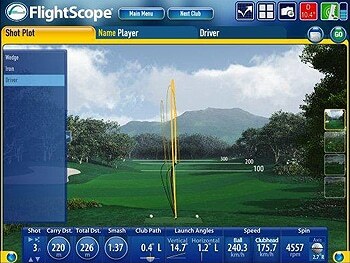 FlightScope software now displays correctly on high DPI screens. Client mode IP address is now saved. Client mode now uses the detection mode of the server. Fixed the application that was not displaying correctly on a secondary monitor when not activated. Fixed the 3D club that showed as a black rectangle in reports. The error message "Connected sensor is not loaded with golf firmware..." is now not displayed unnecessarily anymore. Battery is low warning is not displayed anymore for a FlightScope X2 with AC power connected. Battery not showing warning for sample downloads is not displayed anymore for FlightScope X2. Trajectories now display correctly on the shot plot when the display units are changed through F10. Fixed the FlightScope X2 camera brightness setting that was not working when a second webcam was connected to the PC. Fixed the FlightScope X2 camera that stopped to work on some DELL Laptop PC’s after a few seconds. Fixed a bug where the "<" or ">" character in a club name caused the club list not to load on the group entry form and where shots didn’t display on shot plot screen. The shot plot screen is now recreated when a session has ended if the system has less than 100 MB of memory available, this minimizes memory usage. Updated the sensor status to not show disconnected while the sensor is waking up. Fixed the error that occurred when double clicking on the “All Results” button on the table screen. The 3D club type now changes to the same club type setting used at the top right during a player/ball comparison session.